Follow Mike Patton aka The General as he puts his thoughts in on sports. But unfortunately this talent come with the baggage of a kid that just cannot seem to get it right off the field. And more than likely, we will not see this talented player on the field in 2013 and maybe not ever again. It’s a sad tale of the monster within destroying a talented player and like many others and it’s a shame. We may not ever get to see the greatness of Gordon because he just cannot seem to get out of his own way. Many have suggested that Gordon really needs some help and that is true. But what is not mentioned is that he has to be able to receive the help that is offered. Cris Carter, one of the greatest NFL receivers of all-time, addressed Gordon’s situation on ESPN’s Mike & Mike in the Morning on Monday morning. He recanted the demons that followed him early in his career in Philadelphia and what it took for him to break through and finally realize that it was time to make a change. He said that he had help offered to him and he also had supportive teammates. But what he said hindered him the most is his own value of the situation. Carter went on to say that he would attend Alcoholics Anonymous meetings during his time in Philly and would not take them seriously. But over time and more meetings, he began to realize that he was an alcoholic and that he needed to take the classes seriously instead of just doing so because the NFL made him do so. Even though Carter began to straighten up in Philly, he said that he was still cut by the team because then-coach Buddy Ryan could not trust him anymore. And it was then at that point that Carter knew he had to continue to make the changes necessary so he did not have this happen again. Carter went on to get another job with the Minnesota Vikings and he never looked back. Carter’s story may not be the same as Gordon’s, but it bears some resemblance. 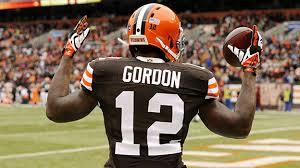 And what happened to Carter with the Eagles may be just the thing needed for Josh Gordon. Carter suggested the Browns need to cut Gordon. Sometimes in life, people take things for granted. In this case, Gordon seems to not realize that his problems off the field can take away the thing he loves to do: play football. And even when facing the year-long suspension, he still does not get it at all. So, the best possible solution is to take football away from him at this time. He has proven that his off-field issues have become too much for him to bear along with being a football player. Maybe with some time off from the sport, he will realize, like Carter, that he has to get some things in order to not only be a good football player and teammate, but a good person. At the end of his interview with Mike & Mike in the Morning, Carter said that he hopes to get a call from Gordon so that he can help him. I too wish that he makes that call. Gordon is a talented young man and it would be a shame to see him waste all that talent due to not getting his life in order. I am sincerely praying that something wakes this young man up before time runs out on what could have been. Realize you have an issue before it’s too late Josh. For more sports talk, feel free to follow me on Twitter @General_MP or check me out on Facebook at Mike Patton-The General .